I grew up eating roast chicken. No, really. 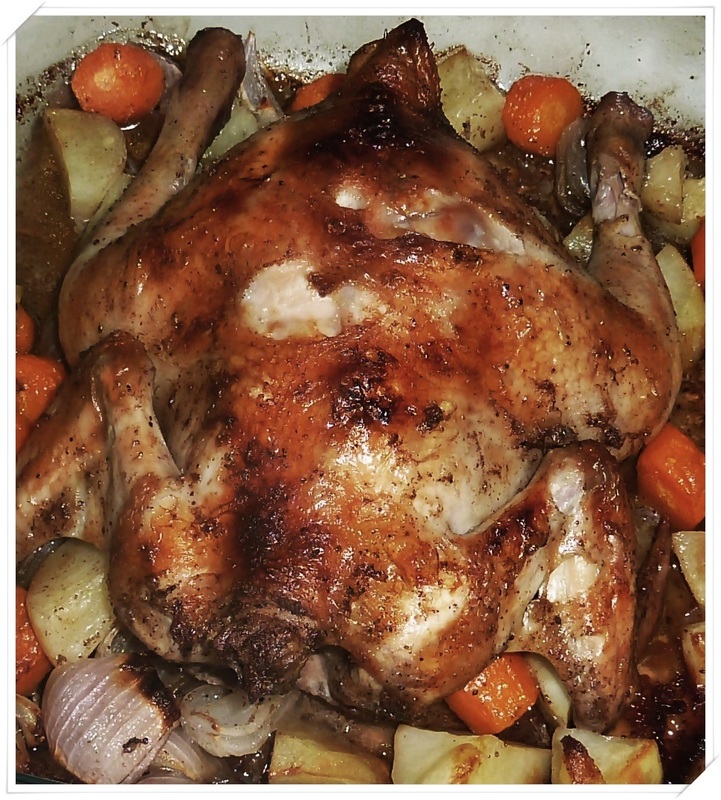 Ah-mm’s version which no one can beat, come with cubed potatoes, carrots, onions and yam stuffing, precooked slightly before being roasted together with the juicy chicken. 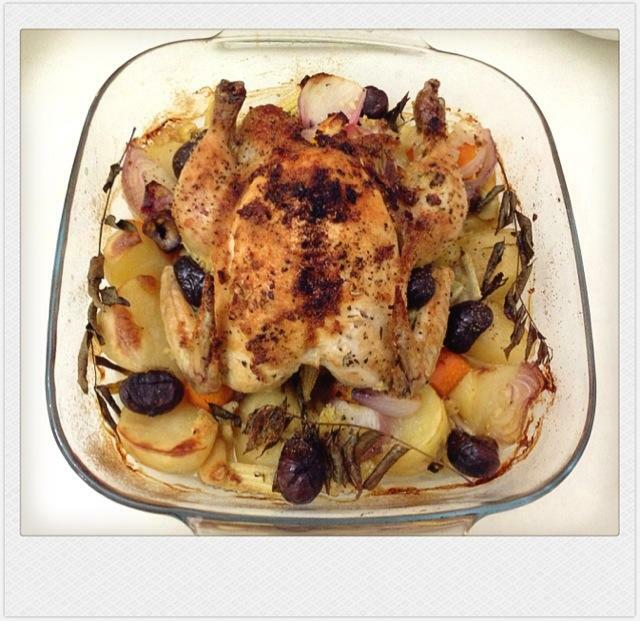 Apart from stuffing the chicken with the root vegetables, she scatters alot of them all around her treasured Pyrex dish. 45 minutes later, the aroma of soy-sauce, crispy skin, and the sweetness of the vegetables permeate even the gaps of your locked door. You know, as a teenager, you always locked yourself in your room. I think this was her way of getting me to socialise with the rest of the world. I never asked her how to make that roast chicken. Truthfully, I never really wanted to learn everything that she could cook, not even the family favourites. I guess in a way, I have some screwed up thinking of wanting to preserve her identity, ironically, because only Ah-mm could cook those dishes. 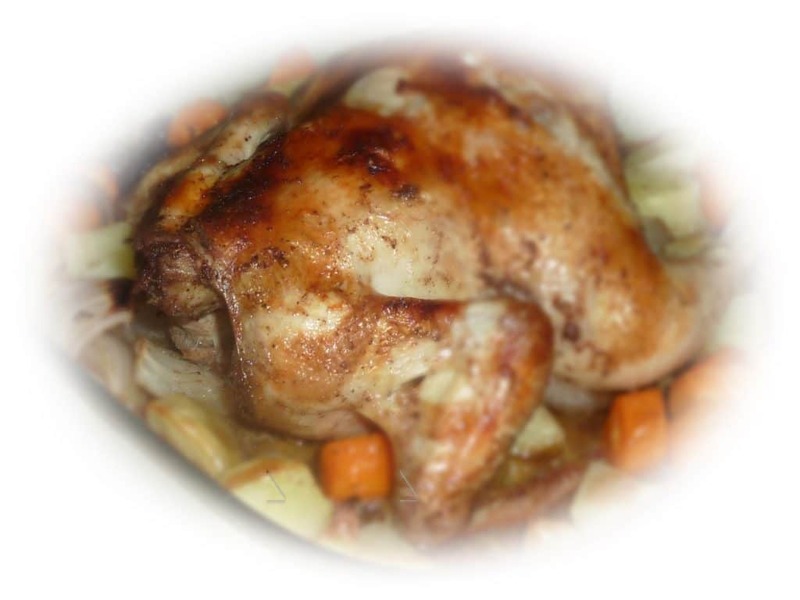 I never stopped loving roast chicken though and am always looking for easy ways to prepare them. 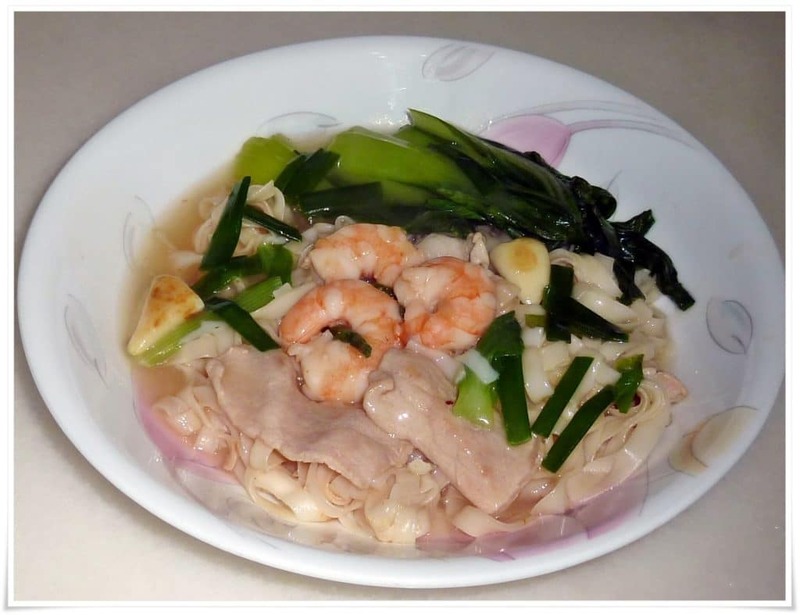 The second picture above was our dinner yesterday night when I only reached home at 7pm after accompanying 88 to the eye doctor. A chicken in 45 minutes including preparation of the chicken and vegetables, preheating the oven and actual roasting time. My job was made easier (and quicker!) with Seah’s Spices. I used Seah’s Salt Roasted Chicken Spices in both versions of roast chicken I made- the first pic was a version with chestnut stuffing. 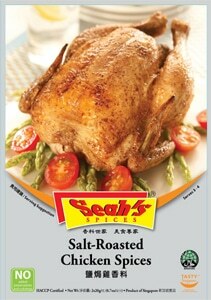 I have to say that Seah’s Spices made the roast chicken more aromatic then my usual marinade of soy and oyster sauce, pepper, chicken seasoning and garlic powder. You know, being budgetpantry, I can’t possibly “happily-happily” go out and grab different bottles of spices just for one dish although I would like to. I think this spice packet was $1.50 and it contains 2 sachets. Works very well for me! Preheat oven to 240 degrees for 5-10 mins. 1. Clean chicken and rub soy sauce, oil/ butter and spices all over chicken. 2. Stuff half the onion/ carrots/ potatoes and all of the garlic into the chicken cavity. 3. 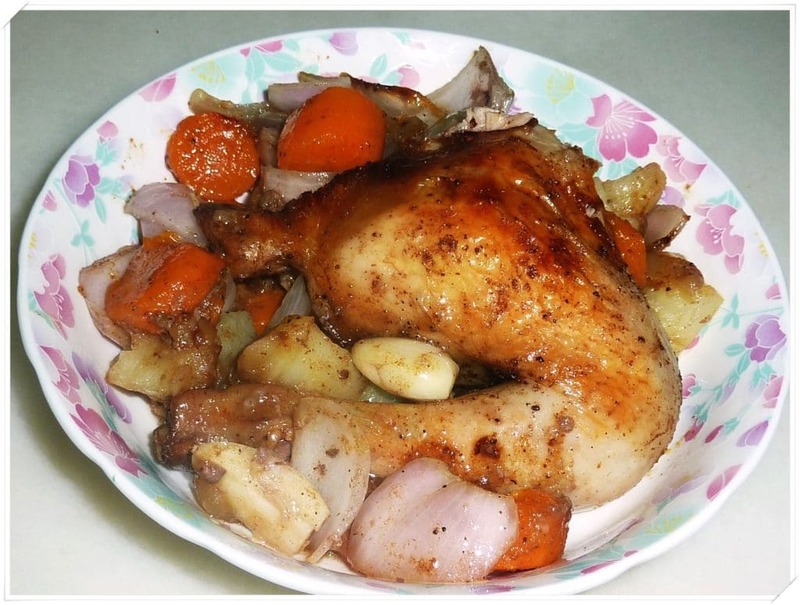 Scatter remaining onion and carrots and potatoes into your baking dish, then place chicken on top of them. 4. Add in the chicken stock. 5. Roast for 15mins on one side, then flip around and roast for another 15 mins. This was how it turned out.. so fat and juicy with amazing colour and just-nice crispiness. I quartered the chicken and it was just right for the four of us because I also prepared Furong Egg and soup last night. For bigger eaters, I would say one spring chicken is good for 2-3 people, or for 1, if you’re any one of my brothers.